Super Diamond Mine Video Slot Guide & Review - Casino Answers! Super Diamond Mine is a 5-reel, 9-line video slot developed by RTG. 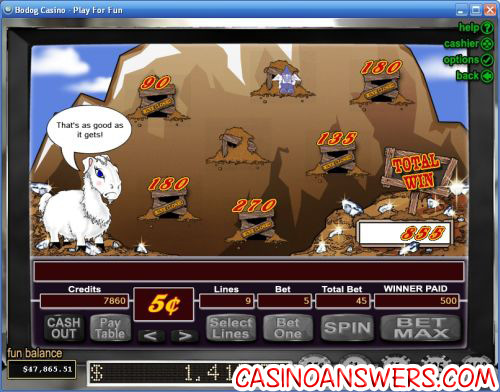 It features cascading symbols, a bonus game and a progressive jackpot. You can play Super Diamond Mine at Aladdin’s Gold Casino and Winpalace Casino. 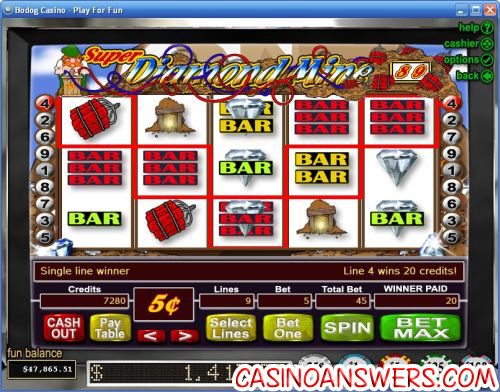 Super Diamond Mine is a video slot sequel of the popular classic reel slot machines Diamond Mine and Diamond Mine Deluxe. Symbols in Diamond Mine Deluxe are as follows: Mine, Diamond, Dynamite, Boulder and three Bar symbols. The Boulder symbols do not pay out. Their purpose is simply to disrupt a winning combination. When playing Super Diamond Mine, it is important to choose a coin value and stick with it. The reason for this will be explained later in this review. Coin values are $0.01, $0.05, $0.25, $0.50, $1 and $5. Once you have chosen a coin value, you must buy your chips, which are in denominations of $0.25, $1, $5, $25 and $100. Buy as many as you like – you can cash out at any time. After you’ve bought your chips, set the number of active paylines (up to 9) and the coins you wish to bet per line (up to 5). The bets are listed in coins, take your coin value, multiply it by your bet per line and then multiply that number by the number of paylines. The coin values from $0.01 to $0.50 each have a unique progressive jackpot, whereas $1 and $5 have fixed jackpots rather than progressive jackpots. You can bet anywhere from a penny to the maximum bet of $225 per spin on the Super Diamond Mine slot machine. One of the special features on Super Diamond Mine is the Cascading Diamond bonus symbol. When these Diamond bonus symbols appear on a reel, they will slide across the reel in the direction they are pointing. As they slide of each symbol, they will drop into the symbol, increasing the number of diamonds available for payouts. Diamonds can also appear on other symbols in the game. The Diamond bonus symbols have another purpose on Super Diamond Mine. Collect 99 of these diamonds throughout the game and you will trigger the Super Diamond Mine bonus game. In the game, you must tell a gnome miner to go into seven different mines. The game will continue until a mine collapses on the gnome. You can win up to 4950 coins playing the Super Mine Diamond Bonus game by playing with the maximum bet on all 9 paylines. If you change the coin value on Super Diamond Mine, your diamond counter will be reset to zero. Super Diamond Mine has a progressive jackpot on the $0.01, $0.05, $0.25 and $0.50 coin values. The progressive jackpot will vary depending on the coin value you are playing on. The progressive jackpot will not necessarily increase on a higher coin value. To win the Super Diamond Mine progressive jackpot, line up 5 Mine symbols on an active payline. On $1 and $5 coin values, Super Diamond Mine has a 10,000 fixed jackpot. On all coin value settings, the second highest jackpot is 6000 coins if 5 Diamond symbols appear on an active payline. To play Super Diamond Mine, along with Diamond Mine and Diamond Mine Deluxe, please visit Aladdin’s Gold Casino for a 200% unlimited bonus! Can USA players play the Super Diamond Mine video slot for real money? American players can play the entire Diamond Mine slot series at Aladdin’s Gold Casino and Winpalace Casino along with several other Realtime Gaming casinos. How do I win the Super Diamond Mine progressive jackpot? To win a Super Diamond Mine progressive jackpot, hit 5 Mine entrance symbols on an active payline on one of the following coin values: $0.01, $0.05, $0.25 and $0.50. The two highest coin values ($1 and $5) have a top fixed jackpot of 10,000 rather than a progressive jackpot. Is there a super version of the Diamond Mine casino game? Does the Super Diamond Mine Video Slot Machine have a progressive jackpot?